I photographed this moose (there was a second one nearby as well) two days ago here in northwestern Alberta. I cropped top and bottom for this 16:9 format. Nikon D500, 600 f4, 200 iso, f7.1, 1/1000, beanbag. The color version is ok but I didn't think color added to the overall photo so I did the monochrome conversion in LR. Thanks for your views and comments you may have. Interesting idea to go for B/W and I like the wide crop and winter mood. The pano view works well here, Gary and I like your composition. While I'm not a fan of b/w for landscapes or animalscapes in general, (I do like intimate b/w portraits) - it seems to work well with this image and adds to the mood. 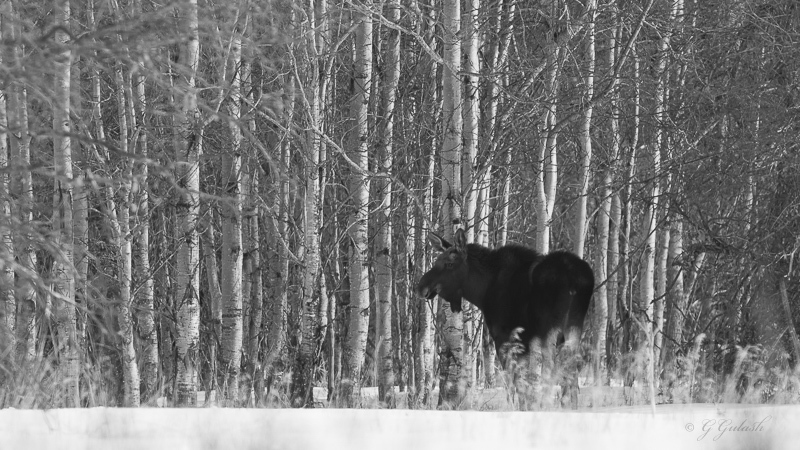 The B&W makes for some very nice contrasts , perhaps accenting the moose. Nicely ddone. Nice framing and composition! Like the treatment! I didn't actually notice this was black and white until I read the text. This type of scene doesn't have much colour in it at this time of year, especially if there's no direct sun. It certainly shows a moose in her territory quite well.